I first saw and heard Dom Turner and Pete Burgess sometime in 1980 when BEACHHEAD was performing a regular (if shortlived) Tuesday night at the Leichhardt Hotel in Sydney's inner-west. The (then) publican had decided to try and expand his music nights - we were given the Tuesday and a young band, TERRAPLANE BLUES (named for the old Robert Johnson tune) were tried out on the Thursday. Neither of us lasted very long and the Thursday nights were given over to Sydney's legendary FOREDAY RIDERS in an attempt to build the crowd up! They did and held the night for awhile until the publican's greed got in the way - a story that was all too familiar at times! I didn't see a whole lot of either Dom or Pete over the next couple of years, didn't have much involvement in music either at it happens, until I moved to Balmain in late 1983 after starting work at Reader's Digest. Balmain was a whole other experience in those days and you could spend an entire weekend, given you had enough cash, walking from one venue to another from Thursday night right through until Sunday night listening to either jazz, or blues depending on your taste or mood at the time. At one stage, I can recall Dom Turner telling me about a new gig he and harmonica player, Rex Hill were starting up in Roslyn Street, Kings Cross (on a Tuesday night from memory) and asking me to come along and maybe sit in and sing a few. Alas, for whatever reason, I never made it and consequently missed seeing and hearing the band in that formative period. However, I regularly went and saw Dom, Pete and (I think) Rex in 'electric' mode with the STUMBLERS at the Cat & Fiddle Hotel in Balmain when ever they played there - Dom was and still is one of my favourite 'slide' guitarists in this country. While I was working at Digest, and sometime during my residence in Balmain (1983-1986), Detroit-born friend and co-worker, Phil Hammial came running up to tell me about this great acoustic blues trio he'd heard called the BACKSLIDERS (by this time they'd included Peter Burgess on drums & percussion). He couldn't stop talking about them! Apart from hearing them on 'live-to-air' broadcasts from the Stormy Monday Blues program on 2 MBS-FM occasionally, I never actually got to see the 'original' band playing 'live' and only finally caught up with them one Sunday night sometime in 1988 at the Bridge Hotel (Rozelle) after finishing my own gig with Tony Barnard's ALL HAT JAZZ at the Unity Hall (Balmain) when someone else at our gig said they were going down and did we (myself & wife, Shirley) want to tag along. We did and still have the two T-Shirts we bought! By that time Rex had left and the band now had Jim Conway (formerly of 'Captain Matchbox' among others) on harmonica. While there I can recall Austin Harrison, Stormy Monday presenter and longtime Backsliders champion, turning up with a pre-release pressing of what was to be their first ever vinyl LP recording. When it was released we bought a copy that we played many times thereafter! It was a great album and it has now been released for the first time on CD. The original pressing, being a single vinyl LP, didn't allow for all tracks recorded to be released. This situation has now been rectified and these two tunes appear on 'Disc One' of the two CD set as released by Full House Records. The second disc consists of fifteen previously unreleased 'live' performances made between 1987 and 1989. Disc One of the CD opens, as did the original vinyl with Robert Johnson's Hot Tamales (aka They're Red Hot) and is followed by Red River Blues (John Jackson). These in turn are followed by Leadbelly's Gallows Pole (Gallis Pole) which is apparently "a furious and dynamic version of The Maid Freed from the Gallows" (as described in a review of a collection of Woody Guthrie/Leadbelly tunes called 'Original Vision' by Steve Leggett), Special Rider (Skip James), Pick A Bale of Cotton (Leadbelly), Tampin' That Thing (Yank Rachell), Statesboro Blues (Blind Willie McTell), Stop Breaking Down, Preaching Blues, 32/20 Blues, Come On In My Kitchen, If I Had Possession Over Judgement Day - all penned by Robert Johnson. Still on Disc One, but this is where we leave the original and head into new territory with the addition of Leadbelly's On A Monday and a Blind Willie McTell tune that I'd never heard 'til now called Warm It Up to Me. Disc Two opens with an early 'Live-to-Air' from Studio 2 at 2MBS-FM in Crows Nest (Sydney) in June 1987 and features the 'original trio on Blind Blake's Sweet Jivin' Mama, an instrumental version of the traditional piece Railroad Bill, Robert Johnson's Hellhound On My Trail and what Dom describes as "Mississippi Fred McDowell's Train I Ride Is Fifteen Coaches Long". This last is more commonly known as the Herman 'Little Junior' Parker song Mystery Train. Then 'live' from Sydney Town Hall in August 1987 and the band is in 'duo' mode (Rex Hill had moved on by this stage) this time. They start with McKinley 'Muddy Waters' Morganfield's Can't Be Satisfied, move onto John Adam 'Sleepy John' Estes wonderful Diving Duck Blues, Chester 'Howlin' Wolf' Burnett's Saddle My Pony and finish with the Robert Johnson gem Sweet Home Chicago. In the liner notes the aforementioned Austin Harrison comments how he "naïvely" pushed for them to perform at this "predominantly classical music affair" beside many "performers nationally, if not internationally known" and how, by the end of the fourth track from this performance (Sweet Home Chicago) they had the entire Town Hall screaming for more! The final set of seven tunes is yet another 'Live-to-Air' from MBS and features the band as Shirley and I saw it that night in Rozelle - Dom (guitars & vocals), Pete (drums & percussions) and Jim Conway (harmonicas). The tunes are Memphis Minnie's Cherry Ball Blues*, Leadbelly's (When I Was A Cowboy) Out On The Western Plains, Arthur 'Big Boy' Crudup's Mean Ole Frisco, Leadbelly's Scottsboro Boys, Blind Boy Fuller's Lost Lover Blues, Tommy Johnson's Big Road Blues and 'Mississippi' Fred McDowell's Kokomo. *Dom describes Cherry Ball Blues as being written by Mance Lipscomb however, I can find no reference to him ever writing it. The words used here are those as used by Lizzie 'Memphis Minnie' Douglas in a song of the same name which is also described as being responsible for a Skip James' composition of the same name. Interestingly enough, when you track down the Memphis Minnie recording there is no composer listed. Special Rider which for me captures the essence of Skip James' original. Gallows Pole because the first blues that I ever heard were those of Leadbelly and I am sick at heart for what Led Zeppelin did to this many years ago. Tampin' That Thing - just because I like it! Statesboro Blues because I love damn near everything of Willie McTell's that I've ever heard and this is so much closer to the original than the way I hear it done by everyone including myself! Railroad Bill (done here as an instrumental) which I have loved since I first heard it nearly forty years ago on an old Alex Campbell (Scottish-born Folksinger) album from 1963. Just a little trivia here - Terry Hennessy (formerly of the Mudsteppers, alongside Damien Coen, Damon Davies/Chris O'Connor & Adam Barnard) played 'mountain dulcimer' on several recordings with Alex in those days. Hennessy is actually a World-renowned luthier in his own right. The real 'standouts for all would have to be any of the Robert Johnson tracks when one considers Dom Turner's downright bloody amazing guitar playing! He is certainly no slouch when it comes to the intricacies of either Preaching Blues, or If I Had Possession Over Judgement Day! In truth, there is not a bad track on this album and they are all standouts. All are worth having and listening to again and again and again! 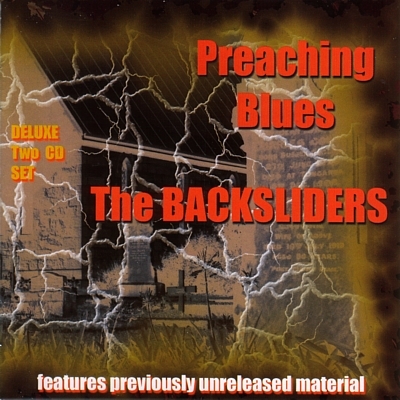 The Backsliders were the first of a 'new breed' of acoustic Blues players in this country (Australia) and, consequently, a real breath of fresh air for those of us who loved that style of playing. It was something that many of us had been missing for a very long time. Today, even with their current line-up (Peter Burgess has gone and has been replaced by Rob Hirst - formerly of legendary Aussie rock band, Midnight Oil) they are still at the forefront and still that same breath of fresh air!